This note comes from the prestigious Bebee Collection, one of the most comprehensive collections of US paper money ever assembled. 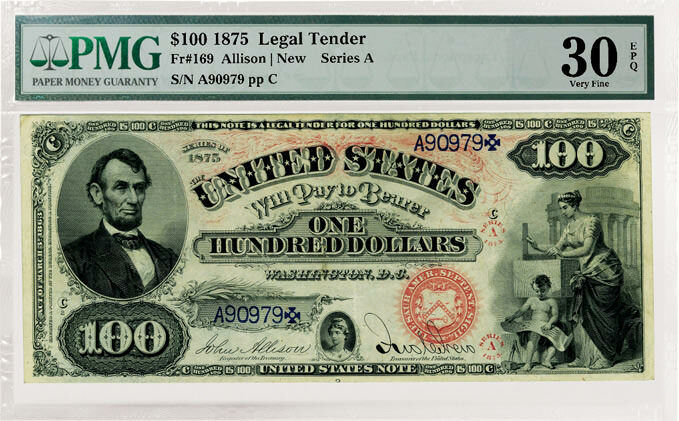 The collection features 904 notes including national bank notes from virtually every state and territory and perhaps the finest collection of large size notes outside of the Smithsonian Institution. The collection was donated to the ANA Edward C. Rochette Money Museum by Aubrey and Adeline Bebee in 1987 and PMG, the official paper money grader of the ANA, graded and encapsulated the collection in 2010 before it was placed on display at the summer ANA World’s Fair of Money in Boston, August 10–14, 2010 and then on the ANA website. This large size note features a portrait of Abraham Lincoln on the left side and an allegory representing Architecture and Liberty on the right. Charles Burt engraved the portrait of Lincoln based on a photograph by Anthony Berger in 1864. Burt’s engraving remained in use on other large-sized notes until 1928 when currency was reduced to the smaller size we use today. This portrait is well known to most who have handled a $5 note as the same engraving of Abraham Lincoln was then used on the five-dollar bill from 1928 until 1999. The featured $100 note is signed by John Allison and John New. The seal is small and red with rays. 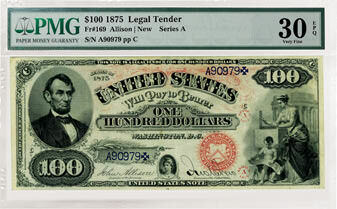 When creating the 1875 series, the words “TREASURY NOTE” on the front were changed to “UNITED STATES NOTE”. To view other notes from the Bebee collection, visit www.ana-museum.org.